Abstract: After being abandoned for nearly 400 years, some of the ancient Iron Age hill forts were re-occupied and re-fortified in the later fifth and early sixth centuries. Interestingly, some ‘new’ hill forts were also erected at this time. I believed that a study of this phenomenon might shed light on social and economic conditions in post-Roman Britain. I focused on three recently excavated and well-documented hill forts that were occupied at various times during the early medieval period: Dinas Powys, South Cadbury and the Mote of Mark. I explored the commonalities and differences between these forts to see if there was any common purpose behind their re-occupation. These sites have been interpreted as the ‘high status’ residences of British kings and princes. This view was fuelled by the discovery of pottery sherds from imported amphorae and drinking glass, fine metalworking and possible large ‘feasting’ halls. However, this is not the only possible interpretation of the evidence. Indicators of status are also discussed and a new model for occupation suggested, using the words high value rather than high status. 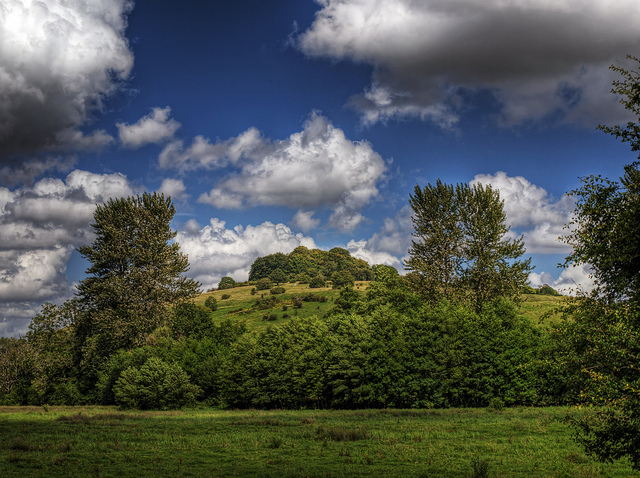 There is evidence to suggest that the occupants of the hill forts may not all have been British. ‘Germanic’ and Irish immigration appears to have been well advanced and many of the artefacts found at hill forts suggest trading and interaction between these groups and the British population. I have tried to discover who lived in these hill forts, why they should have chosen to do so and what purpose they might have had for the forts. Although I was unable to uncover a single common purpose for the re-fortifications, I believe I have been able to shed some light on the cultural and social changes in this archaeologically ‘dark’ period.